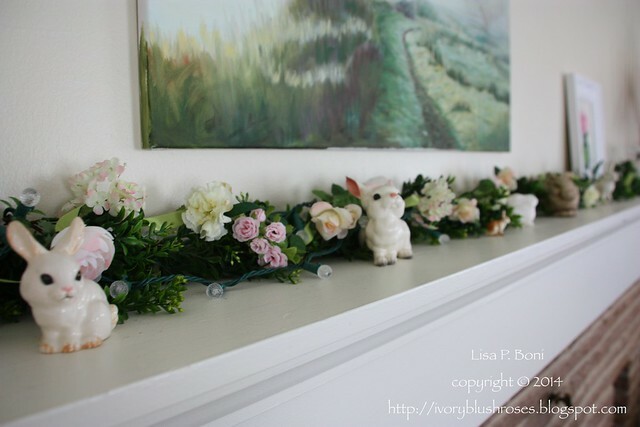 With all the wedding planning taking place, I'm not doing much Easter decorating this year. Just a few things out. The old sugar egg, which has miraculously survived several moves, time in an overheated storage locker, and well below zero freezing temperatures in the garage before I realized that it was out there with the camping gear! The forsythia are blooming beautifully in the yard right now, but with up to 6 inches of snow and freezing temperatures predicted for tomorrow, I thought I'd clip some to bring in and enjoy. The bunnies live on top of the china cabinet most of the year. It's all very simple compared to what I usually put out at Easter. 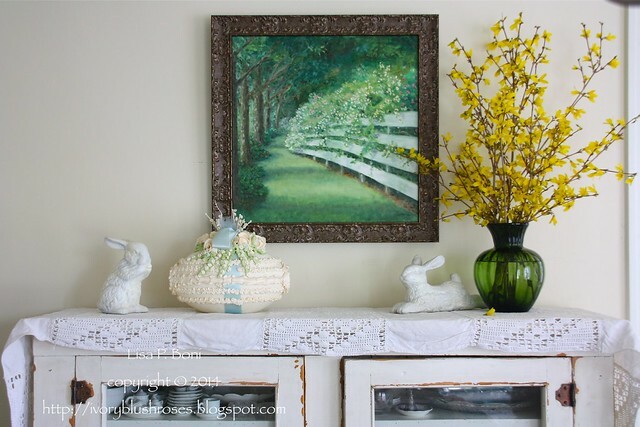 The only other decorating I've done is to add some bunnies and a flower garland to the fireplace mantel and to change out the paintings from winter themes to spring themes. 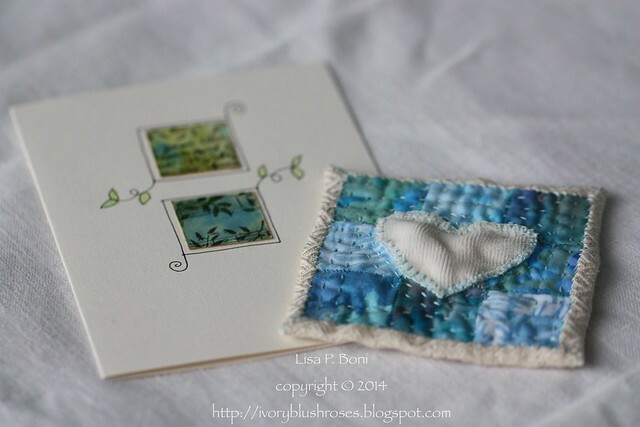 One of the things I enjoy creating are these little pocket prayers that I send off to friends who have been coping with difficult times. This one went out a couple of weeks ago to a dear friend. They are only about 3 to 4 inches square. All hand stitched. 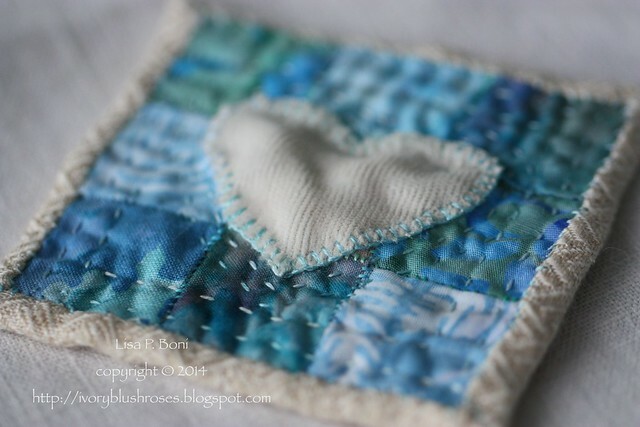 I love using textured fabrics, velvet and hand quilting on these. 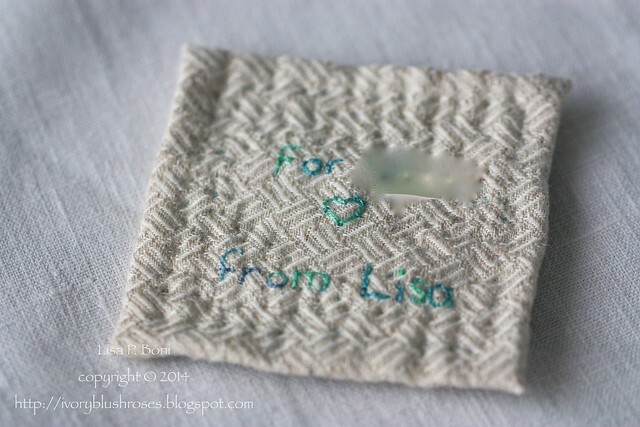 The idea being that the recipient can tuck them into a pocket, a purse or simply keep it nearby. Their tactile nature encourages touching and holding them, and in doing so, I hope that the recipient is reminded that they are prayed for, loved, and in my thoughts. What a wonderful idea! Prayer is very important! I love to sew by hand. What a lovely idea the pocket prayers are. WOW! You can see and feel the love and care that went into that pocket square,and I'm sure it is felt by the recipient. Lovely gift.